Near the end of Act I of Anastasia, a Bolshevik Russian general named Gleb (played on tour in Chicago by Jason Michael Evans) sings a song about pursuing a woman he believes might be the show's title character, who years earlier may have survived the assassination of her family, the formerly ruling Romanovs. 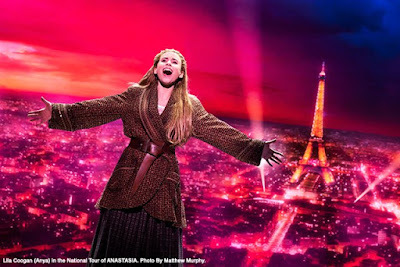 The song is called "Still," and it's a nice, professional showtune written by the musical's noted composer/lyricist team, Stephen Flaherty and Lynn Ahrens. 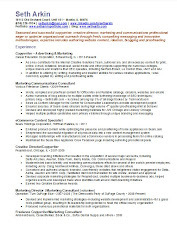 Evans delivers it quite well. But as a solo number for a male authority figure, about chasing after someone he sees as a fugitive, nearly closing out the first act and even having a five-letter, one-word title beginning with "St," it couldn't help remind me of "Stars," which serves much the same purpose in Les Miserables. And, even in trying not to factor in the benefit of familiarity, "Stars" is just a far, far better song than "Still." Which kinda encapsulates Anastasia, which is derived from the 1997 animated film but whose songs are mostly new. About to end its Broadway run after two years--I did not see it there--the show is solidly entertaining, with a good narrative, some fine songs, nice scenery and an excellent touring cast. 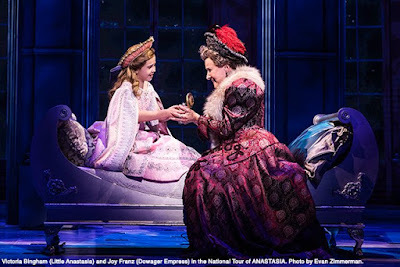 Referencing its storyline based on long-persistent rumors that the Romanovs' youngest child survived and lived clandestinely, Anastasia--as a piece of musical theater--is not an impostor, it just isn't majestic. I love classic, fantastic musicals and in coming months am looking forward to seeing, among others, new productions of A Chorus Line (at Porchlight Theater), West Side Story (at the Lyric Opera of Chicago) and The Music Man (at Goodman Theatre). Though I've seen each several times, I love virtually every song in all of these shows, and can't wait to hum, tap and sing along (hopefully quietly) yet again. 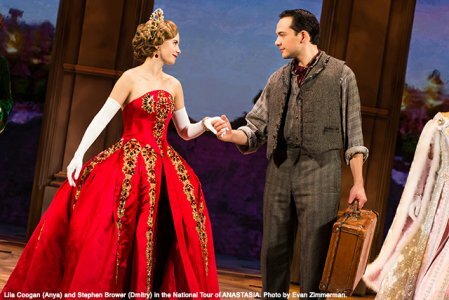 Hands on a Hardbody and Bright Star in local Chicago productions; A Bronx Tale and now Anastasia on national tours as part of my Broadway in Chicago subscription series. 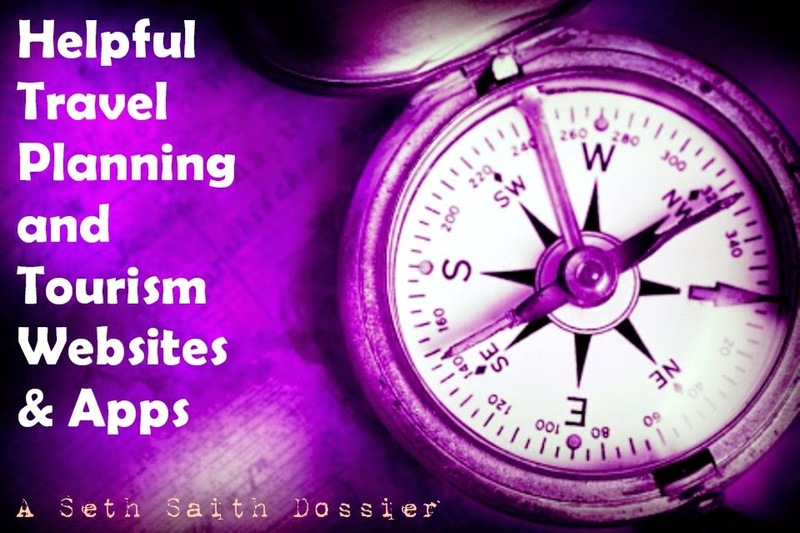 To varying degrees--you can see the other reveiws by clicking the hyperlinks--I've liked all of them. And even more so, I've valued seeing them, just as recent entries in the musical theater canon. And as something different. 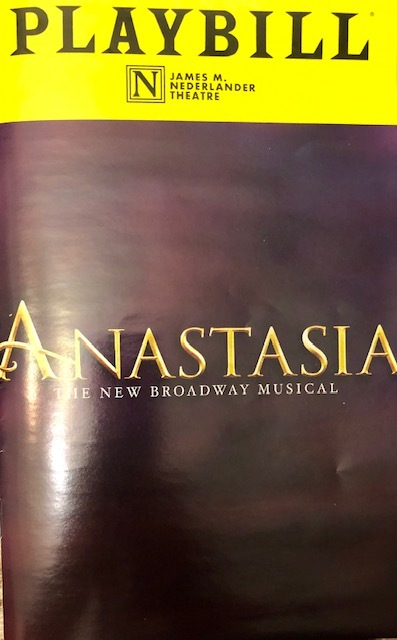 Which brings me back to explaining that although Anastasia isn't phenomenal, it's an impressive endeavor--perhaps even far more so to those who haven't seen tons of better musicals--and a satisfying night of entertainment. I don't need to reveal too much of the narrative, but Dmitry (Stephen Brower) and Vlad (Edward Staudenmayer) are schemers in Leningrad--which St. Petersburg has been renamed by the Bolsheviks--who want to pass someone off as Anastasia, find the possible real deal and manage to bring her to Paris, where her grandmother the Dowager Empress (Joy Franz) now lives. Lily (Tari Kelly), the Empress' lady-in-waiting and Vlad's ex-lover, also factors in and leads the fun group number, "Land of Yesterday," and I've already mentioned Gleb, whose interest in Anastasia isn't simply in her capture. With a book by the venerated Terrence McNally, choreography by Peggy Hickey, sets by Alexander Dodge and costumes by Linda Cho, Anastasia is--under the direction of Darko Tresnjak--consistently a pleasure to look at. But while I've liked past Flaherty/Ahrens collaborations such as Ragtime, Seussical and A Man of No Importance--and have listened to their score for Rocky the musical and hope to see it someday--too few of their songs here stand out as special. Even after having listened to the Broadway cast recording a number of times. 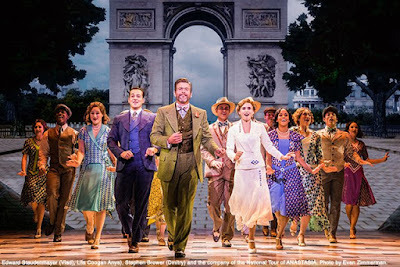 Many of the songs that were in the movie--which Flaherty & Ahrens scored, along with David Newman--are among the best in the musical, including "A Rumor in St. Petersburg," "Learn to Do It," "Once Upon a December," "Journey to the Past" and "Paris Holds the Key (To Your Heart)." This isn't to say there aren't some other decent tunes, and all are well sung, but too much of the music is pedestrian and forgettable. MacKillop and Ronnie S. Bowman Jr. doing impressive dancing. 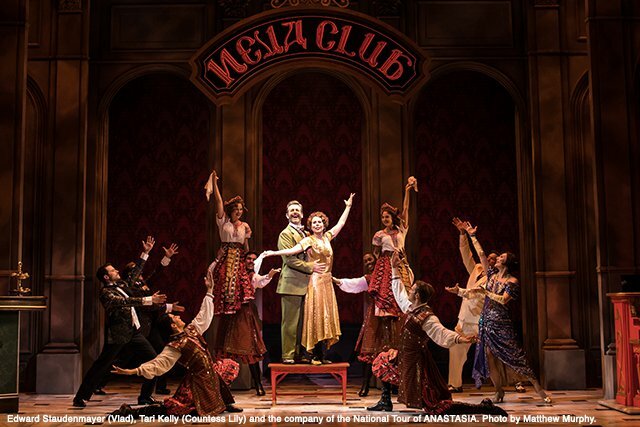 So in one way or other, there's plenty to enjoy in Anastasia, and if you love musicals, this is one worth knowing. It's a likable show with great talent and strong production values. But though the effort is noble, I just can't crown Anastasia as undeniably imperial.